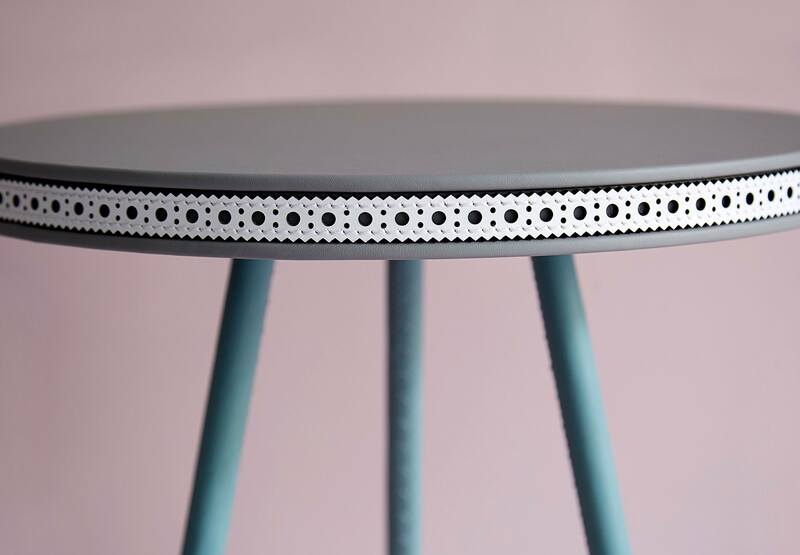 The Brogue family of tables is inspired by the leather broguing more typically seen on shoes native to Ireland (bróg is Gaelic for shoe) and the classic three-legged Welsh cricket tables, designed to stand on uneven slate floors in the homes and public houses of Welsh mining villages. The leather strip, with decorative perforations and elegantly stitched waxed thread, is laser-cut in London using belting leather for its durability, while the legs are wrapped in Spinneybeck leather and finished with solid brass or stainless steel feet turned, brushed and finished by craftspeople in Norfolk. Both the Brogue tables and three-colour mirrors are available in contrasting colour combinations from across the Bethan Gray Design colour palette. The Brogue Coffee Table is covered with Spinneybeck leather with a brogued leather strap encircling the table top and four legs finished with solid brass or stainless steel feet. The family also includes a three-legged side table, a four legged dining table and console table and a mirror available in a number of colour combinations.